Asia has already proven to be the next major market frontier for Apple, and as such the company is catering to prospective Mac buyers with new input features custom tailored to Chinese and Japanese speakers. Buried deep within Apple's OS X El Capitan preview webpage is a section describing upcoming system fonts and input methods. Interestingly, the only two improvements listed deal with support for Chinese and Japanese characters. Like the San Francisco typeface introduced with Apple Watch, which was on Monday announced as the default font for iOS 9, Apple created a new Chinese system font called PingFang. According to Apple, characters are "designed for a modern appearance and crisp onscreen readability in both Traditional and Simplified Chinese." Chinese speakers also get enhanced keyboard and trackpad input. Since most computers employ alphabet-based keyboards, language mapping for writing systems with glyph characters and other logographic or syllabic scripts are less than desirable. Apple's OS X El Capitan features an advanced prediction engine that stores commonly used words and phrases to better anticipate upcoming choices. The system also updates its vocabulary list —presumably via the Internet —and presents prediction results in a "smarter" candidate window. Additionally, character drawing has been upgraded with a Trackpad window that reflects the proportions of a Mac's trackpad for better control. Previously, finger input was limited to single character entry. 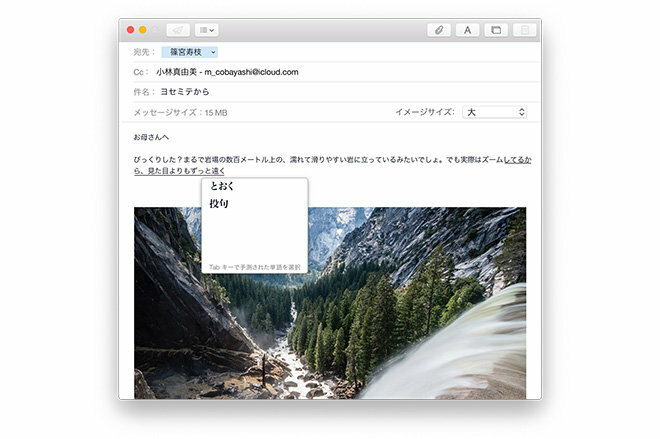 As for Japanese language support, El Capitan dynamically transforms Hiragana text entry into the appropriate Kanji or Katakana. Current implementations require users press the spacebar after every word or phrase to bring up conversion options. Apple also includes new Japanese fonts called Klee, Tsukushi A Round Gothic, Tsukushi B Round Gothic, and YuMincho +36p Kana. Finally, the Hiragino Sans font will gain additional weight alternatives for a more personalized feel.